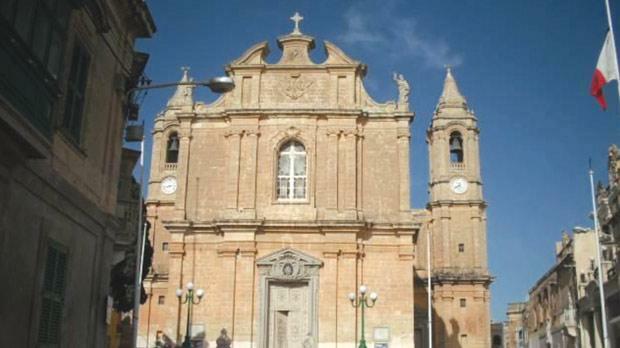 The locality of Għaxaq, as of 1511, always had a church dedicated to the Assumption of the Virgin Mary. In 1626, when the village became a parish, plans were drawn up to build a new church which was completed by 1655. The church served the Għaxaq community for some 80 years following which, in around 1733, a new parish church, the one which exists today, started to be built. The church, which took between 20 to 30 years to be built, has its design attributed to Sebastiano Saliba. The façade consists of three bays on two levels with the central bay separated from the others by two stepped Doric pilasters on either side. The church is elevated by a parvis, where the main portal extends from the wide stairway. The main portal consists of an ornate architrave, with a pediment above having a sculptured escutcheon in its centre. The façade is divided horizontally by continuous entablature and a large ornate window at the centre, topped with a shell motif on its keystone. The transept forms part of the elevation on either side, each consisting of two bays and levels. The inner bays on the lower level each have a smaller version of the main portal. The level above consists of a set back loggia type window. The outer bays are the bell towers which commence at ground level. The Malta Environment and Planning Authority scheduled the parish church as a Grade 1 monument on August 26 as per Government Notice 782.